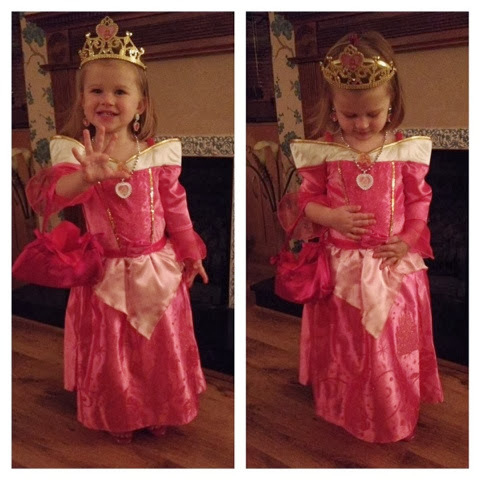 Liv turned 2 last month, along with her second birthday came has dressing up stage! I was glad she chose this one because it has long sleeves, I hate when she has bare chilly arms but no such problem with this outfit. I ordered age 3 because Liv is very big for her age, it fits her perfectly and is topped off with a matching princess tiara. Please note jewellery, handbag and shoes were bought separately. Along with flowers, stars and castles all made from glitter there are also sequins sewn down the bodice, a portrait of the lovely Aurora at the neckline, a lovely 3D rose on the belt and a half petticoat inside for a lovely puffiness at the top of the skirt. At the shoulders you will find an elasticated strap then there is then a small area of bare shoulder before the long satin type sleeve begins. Just under the elbow this becomes a beautiful flared, sheer cuff which I think really gives it the Princess feel. 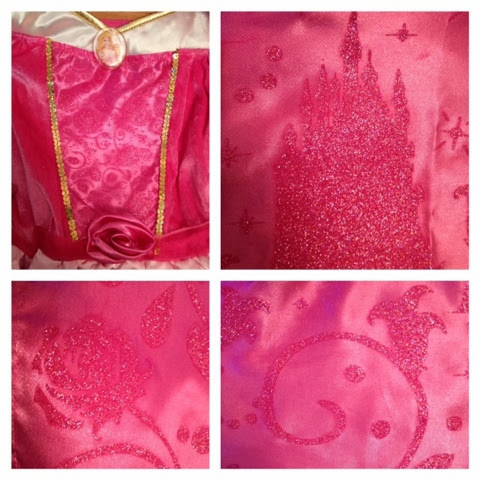 Liv always strokes this part of the sleeve saying "Wow Princess" whenever she puts it on. I would definitely recommend this outfit to family and friends. Priced at only £12 I suspect one or two of the range may make an appearance from Santa on Christmas morning . . . .
Disclaimer - I was sent this outfit for the purpose of the review, all opinion is honest and my own.